Breaking with the convention of double-wall rims, Zipp opts for a single-wall carbon rim for its first entry into the mountain bike market since the 1990s. The last time Zipp made a mountain bike wheel, “Harry Potter and the Chamber of Secrets” was just hitting store shelves. The Euro had not yet become actual currency, and no one had heard of Google yet. The late nineties sure were dark times. But Zipp is back in the MTB game with the 3ZeroMoto wheels. As the name implies, the internal rim width measures 30 millimeters, and as you’d expect from the $1,999 price tag, they’re carbon. That’s hardly the most interesting thing about these wheels, though. These moto-inspired hoops feature single-wall rims. I’ll let you finish clutching your pearls and gasping. Good? Now that we’re done freaking out, just know that Zipp is well aware of your not-at-all-unfounded durability concerns. In fact, that was a primary design focus over the course of the three years these wheels have been in development. Zipp says these wheels can take a much larger force before complete failure than double-wall carbon rim competitors, as well as aluminum rims. More on that in a moment. Aluminum wheels have become standard equipment for many enduro riders and trail riders because they take a beating and can be pulled back into shape should you dent them. They’re far less expensive than carbon, too. For rough riders who abuse equipment, aluminum wheels are a no-brainer. And since aluminum tends to be soft, riders get some compliance built-in. But denting your aluminum rims also means you’ve put a significant weak spot in the hoop. You likely also put a flat spot in the rim — good luck getting your tubeless tires seated correctly. In other words, there are drawbacks to aluminum. Until now, however, those drawbacks haven’t outweighed those of carbon. Carbon is very stiff, which is great for power transfer but not so great for control when you’re pinballing off of rocks. And you don’t get a warning before a carbon rim breaks; it doesn’t dent, it simply fails. And once that happens, you’re out a hefty chunk of cash, although some brands like Santa Cruz have introduced no-questions-asked replacement programs. Since carbon doesn’t flex as much, the tire is left to pull that duty, which leaves your rubber susceptible to pinch flats. To avoid that, you have to either run higher tire pressure, or use tire inserts like Vittoria Air-Liner or CushCore, which adds weight. So summing up the design goals for the 3ZeroMoto wheels became simple: Build a carbon rim that could outlast the durability of an aluminum rim, increase the compliance and forgiveness notably absent in most carbon hoops, while still allowing for the lateral stiffness carbon has become known for. Easy enough, right? It turns out that motocross had the answer. Single-wall aluminum rims are standard equipment on off-road motorcycles, largely for durability but also for control. Like motocross rims, the 3ZeroMoto rims can flex side to side when they encounter impacts. Zipp calls this Ankle Compliance; think of the way your ankle allows your foot to flex on an uneven surface. The rims act similarly, allowing flex that keeps your tire from pinching. It also allows your tire to maintain more traction over obstacles. The rim is also absorbing much of that impact energy before it gets transferred to you, the rider. “We wanted a rim that has life in it,” says Zipp product manager Bastien Donzé. What he means is that the spokes will de-tension during an impact, but the opposing spokes shouldn’t see a spike in tension. That should mean better reliability, but Donzé cautions very aggressive or larger riders should still check spoke tension regularly. Donzé says Zipp has not seen any issues with spokes in the three years of development. Nor have there been many instances of pinch flats. The 3ZeroMoto wheels have been in use for three years by 37 riders. Over the course of a total of 35,000 miles ridden, Zipp says there were only two reports of pinch flats. Zipp claims the 3ZeroMoto wheels, while not indestructible, should be able to absorb forces beyond that of an aluminum rim to prevent failures. You may also be able ditch the tire liner thanks to that compliance. While these wheels aren’t the lightest you can get, they’re pretty competitive when you compare them to lighter carbon wheels that would necessitate a liner. Since you’re likely to run low tire pressure with the 3ZeroMoto wheels, Zipp includes a special Tyrewiz with the wheels. Using the app, you can monitor your tire pressure right on your head unit in real time. You can also look at the LED on the unit itself to see if you’re within your set range of tire pressures; blinking green means you’re right on the money. Blinking red means you’re either over or under your desired pressure, depending on the speed of the flash. 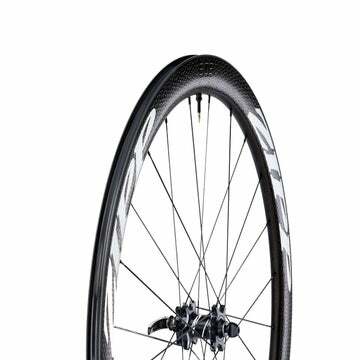 For $1,999, you get a wheelset with the rim strips and TyreWiz pre-installed. The wheels are only available in Boost spacing, so if you want another hub option, you can buy the rims only for $700 each and build them with hubs of your choice. The rims include the rim strips but not the TyreWiz. Both the rim option and the wheelsets come with a lifetime warranty, as well as a crash replacement policy should you damage the wheels outside of normal usage. We’re certainly interested in whether Zipp’s durability claims hold true. That would make the higher price tag worth it for riders who routinely beat on wheels. However, we’re more interested in the ride quality that results from the Ankle Compliance. If it works, the rim should help increase traction in corners and trail chatter. And the vertical compliance of the wheel could mean faster speeds, particularly over high-speed bumps where forks often get packed up. Once we get a wheelset in for testing, we will pay close attention to how the wheels react to hard cornering, fast chatter, and big hits.